This is the OE version of my ws. The ss have to know the following prepositions to do the tasks: in, on, behind, under, above, in front of, opposite, next to, between. The sentences are only in Present Simple. Hope you find it useful. Fill in the gaps with the suitable preposition of time: at, in or on. Prepositions of place (adapted from http://www.englishexercises.org/makeagame/viewgame.asp?id=5347) I altered the above exercise to make it easier for my students. 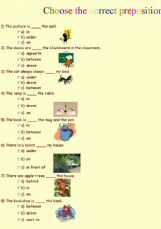 28 sentences different from those in part one, however, covering the same prepositions. Where are my things in the room? 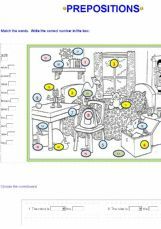 You can practise prepositions of place with this easy-to-use exercise. All you have to do is look at the picture and fill in the missing prepositions.